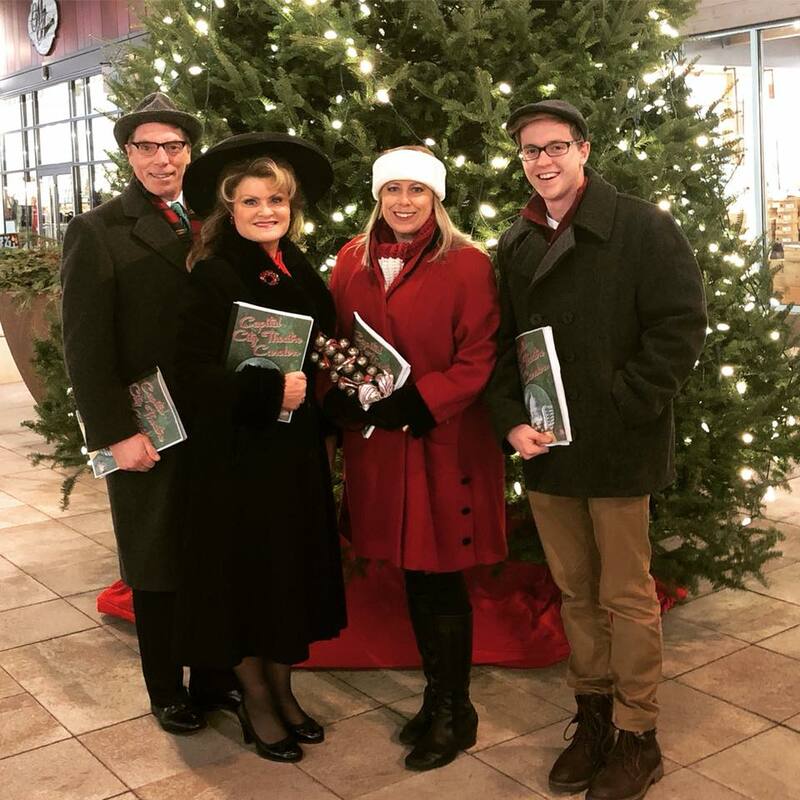 Let Capital City Theatre Carolers bring that perfect amount of holiday spirit to your event or location! Our professional quartets will entertain your guests in nostalgic Norman Rockwellian style. Wearing costumes that reflect seasonal wear from the fifties, our singers croon classic holiday songs with impeccable accapella 4-part harmony. Hear all your favorites like White Christmas, Jingle Bell Rock, Silver Bells, and more! We also include some not so often heard gems like Jing-A-Ling, I’d Like To Hitch A Ride With Santa Claus, and Snow! Want to hear your old favorites? We can do that too, by adding cherished traditional carols such as Silent Night, Jingle Bells, Carols Of The Bells, and many others. Need more than a quartet? We can add as many singers as you need! We have a core group of professional music theatre performers so you get all the expertise of not only incredible singers, but active, engaged entertainers delighting your listeners. Please contact Gail Becker at gail@capitalcitytheatre.org or call 773.612.1799 to set up a booking. All events are customizable and range in price. Where do our groups perform? Corporate events, hotel lobbies, shopping centers, restaurants, schools, libraries, community centers, just about anywhere you need holiday atmosphere. Currently, you can see and hear the Capital City Theatre Carolers at Hilldale Mall and The Edgewater Hotel throughout the holiday season. How long do we sing? Two hours is the booking norm, with one 20 minute break. We can accommodate our sets to your needs. Need a special song request? We can do it. Just let us know ahead of time and we’ll have it rehearsed and ready to go. Do we need a piano or sound system? Not at all! Our groups performs accapella (without accompaniment) and still fill the space! We don’t need microphones either. If you would like a formal performance on stage with mics and a piano, we can tailor that show just for your event! Our calendar fills up quickly. Bookings usually begin by early October. We hope we can bring holiday cheer and these timeless songs to your guests!